Those unexpected items and the feeling you're paying and doing all the work. Self-service checkouts are expanding throughout the UK, but many of us aren't happy with them. So why is the relationship so fraught? Unexpected item in the bagging area? Totally expected feeling of rage pumping through your body? You're not alone. 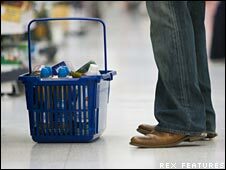 New research suggests 48% of Britons think self-service checkouts are a nightmare, neither quick nor convenient. Quite the opposite in fact, and their complaints are all too familiar. Firstly, there's the bag struggle. Shoppers who follow the "bag for life" mantra may feel they aren't as welcome as they would expect. 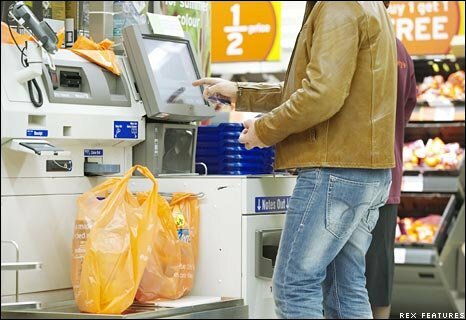 Self-service checkouts often don't recognise them and shoppers may even be charged for plastic bags they haven't used. Then there's the barcode blindness the machines experience with maddening regularity. There's nearly always something they refuse to scan, leaving customers repeatedly swiping, running the risk of repetitive strain injury and feeling a pang of sympathy for those who do this for a living. Finally scanned? Now try and put it in the carrier bag. The phrase "unexpected item in the bagging area" is so synonymous with the 21st Century shopping experience it's become a T-shirt slogan. What's so unexpected anyway? You only swiped the item a second ago and were charged for it. "It's like the machine is very publicly saying 'you are too stupid to do this - go home now'. It's far from ideal," says Bjorn Weber, of retail analysts Planet Retail. Finally, after the palaver of paying, there's the nervousness about leaving the shop. Did I scan it all correctly? Did I select the right type of bread roll from the menu? Will I feel the long arm of the store (manager) on my shoulder as I walk out the shop? "I spend half my time worrying that security will arrest me for selecting the wrong price Blueberry muffin," said shopper Sharon Adams when consulted in a survey on self-service tills conducted by Fatcheese. But it's not as simple as all-out hate for these tills. The people who like them, really like them, say the supermarkets. And they're probably counting among them that contingent of people who have always secretly hankered after trying their hand as a checkout assistant. Self-service checkouts present an opportunity for these frustrated souls. On the rare occasion a basket of shopping goes through without any hitches there's a disproportional sense of satisfaction. Or am I the only one who feels this? However, this occasional buzz doesn't make up for the time spent battling with the machines. But whether we want them or not, they are here and their numbers are set to grow. First introduced in the UK in the 1990s, the number of self-service checkouts is set to double in the next few years. This is because they offer supermarkets quick cost savings and in today's economic and highly competitive retail climate, that has got to be a good thing. Tesco, the UK's biggest supermarket, also leads the do-it-yourself checkout league, with self-service counters in 256 stores. The tills process 25% of all transactions in those shops. Sainsbury's has them in 220 stores and is planning more. And while it may seem extremely trusting to get us to scan our own goods, the machines have in-built weight controls as security measures. Waitrose offers a variation on the theme. It has no such tills but has a Quick Check service where people scan and pack items as they shop. The aim is to really cut back on time at the till. Supermarkets say the move towards self-service checkouts is not all about cutting costs. They argue the tills can speed up your shopping trip, says Ahmed Zaman, from shopping website Fatcheese, which conducted the research. "But many shoppers have yet to be convinced that they really save time," he says. That's because they only do in extremely selective circumstances - if you have one item and can walk straight up to a self-service till for example. "People perceive self-service checkouts to be quicker but that's because they are actually doing the work," says Mr Weber. "In reality they take longer than someone serving you, but it's annoying for the shopper to stand around waiting. "This is even the case in countries like the US, where they've had such checkouts for years and shoppers are very experienced at using them." People's dislike of such tills could also be down to something that is very British, he believes. Despite Brit's reputation for being reserved, we like to speak to the people serving us. "If you go to a supermarket in Germany or Spain or Italy, customers might acknowledge the person on the till but they won't speak to them," says Mr Weber. "It's different in the UK, people do speak to them and like to have a conversation." 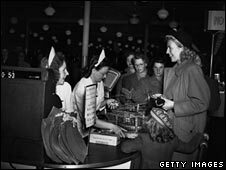 In the past shopping was all about such personal service, but over the years it has become more and more impersonal. From grocery shops, to supermarkets, to shopping on the internet and now the expansion of self-service tills, face-to-face time has been reduced or even excised completely from the shopping experience. Are we becoming antisocial? Not really, our choice is just expanding, says Mr Weber. The key to success is still providing a good service and clued-up retailers are moving the staff they take off tills on to the shop floor. "That's where the real service takes place," he says. "Not at the checkout." And the expansion of such tills does not signal the end of manned ones, not in Britain anyway as it is a distinctly different market for most other countries. Tesco has one express store, opened in Northampton in October, that is self-service only and supervised by just one member of staff. It's just a trial, it says, and there are no plans to open any of its larger supermarkets without checkout staff, like in the US. "Staffing is important in the UK," says Mr Weber. "Supermarkets know long queues don't benefit them. If it's busy they will open more manned tills." Not surprisingly, the supermarkets agree. 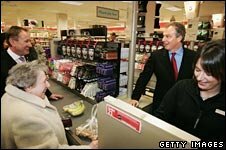 "We'd never get completely rid of manned tills," says the Sainsbury's spokeswoman. "For us it's all about offering people the choice. Self-service checkouts are very popular with the customers who use them a lot, but we realise people either like them or they don't." But for many self-service haters, it comes down to two things. Don't say something is time-saving when it hardly ever is. Also, they're not getting paid, so don't make them do the work. Ever a buy a birthday card using one of these? Don't bother as there's no weight in the card and the bagging area then freaks out as you've not put your card in the bag. The joys of self service. I love self-service checkouts. I can buy those embarrassing items without anyone knowing, don't have to stand behind women or old people fiddling with their purses, and can avoid all form of contact or "conversation" with the checkout assistants. "Unexpected item in the bagging area" - what a surprise, it's the bag I brought to put my shopping in! Encouraged to help the environment and enticed by extra "green" reward points, I bring a couple of bags to take my purchases home in, only to find it confuses the machine to the extent it won't work. If a bag is an unexpected item in the area that bears its name, what exactly is expected?!?! I always use self-service checkouts, I rarely have issues and it is much much quicker. I don't understand why people moan about these tills, after all its a choice, if you don't like them, don't use them. I HATE THESE MACHINES! and no I'm not a old duffer who can't work them! I hate the fact that almost every time you use them you need to ask for help because the machines are not calibrated properly, and I for one miss the communication with the person sat at the till. Get shot of these evil unsociable machines. I use these machines for small amounts of shopping. What annoys me most about them is the way that they make you jump through their hoops - the back and forth with the bag and the 'unexpected item'. I needed a staff member to swipe their card to allow me to use my own bag last time. Lastly, I'll add they're too talkative for me. Sometimes I just wish they'd shut-up and let me get on with it - 'unexpected item in the bagging area', 'do you have a loyalty card', 'please take your shopping', etc. You can turn it off - but it never seems worth it for 5 items or less. I wouldn't mind if they stopped the stupid animations and made the computer faster - I tend to scan, place the item in the bag and then wait for 5 seconds while the stupid animation of "putting the item in the bag" completes before it will let me scan my next item. So basically I'm saying it's the implementation that is the problem, not the concept itself. I used a self-service checkout a few days ago and used my own bag. I happily selected the "I use my own bag" button on the screen (somewhat excited that I could scan my products, still in awe of barcodes). Then the polite voice said "please place your bag in the bagging area". No problem. Job done. Then I had to wait for someone to come and actually verify that it was my own bag! I hadn't even tried to buy anything yet and already the light above my head was flashing red making me feel incompetent! Did they have to make sure I wasn't trying to obtain some extra nectar points by deception?! I'd do it again, though, just because it took me back to my childhood and the time I would play 'Shop'. My local Tesco's has them and I hate them, they take the social point of speaking to the till operator, and feel like you have to rush. But most annoying is that Supermarkets are saving money by not employing people which I think in this current climate is important! I always opt for the self-checkout if I'm not doing a large shop! It really annoys my wife who would rather wait for longer and be served by a person but I quite like it. Not having to answer questions like: 'what's the weather like?' (look for yourself the window is just there! )or 'are you having a nice day?' (I'm in the supermarket on a Saturday - NO!) I know that the machine telling you off is patronising but I'd rather a machine patronise me than a real person. Big Brother gone mad; I used one of these last week at a well known chain of supermarket. Like usual i'd brought my own carrier bag. I scanned my 2 items, pressed the 'have you used your own carrier bag button' and had to wait 5 minutes for a supervisor to authorise the 1 extra loyalty point (value 1/2p) onto my card. I thought these things were here to speed things up and reduce waiting time?!! Hate them, hate them, HATE THEM! The thing that makes me most angry isn't that they're slow, inefficient, noisy, annoying and never work properly. What I really resent is the way that the supermarkets pretend that it's all about efficiency and providing a better service. But it isn't. It's about a machine costing less to run than a person has to be paid. It's so obviously a way for supermarkets to lay people off and replace them with machines. The last time I tried to use one of those things I got so angry with it that I just left everything half processed and walked out of the store. I haven't been back in since and I don't intend to. I went to a rival supermarket that isn't as good because I'd rather pay more for inferior products than contribute to a process that devalues human workers. I am no technology luddite, but I hate these machines. They constantly refuse to scan items, constantly go on about unexpected items etc. However my biggest problem is that they make you do the work yourself. For the amount we have to pay for our shopping the least you should be able to expect is someone to scan your items and to put them in the bag for you. Maybe if they offered a 25% discount on the bill I would think differently!